This 60-minute live professional development Web seminar for educators will be on April 2, 2012, at 8 p.m. EDT. Learn to use the distance formula and the Pythagorean theorem to determine the minimal path and minimal time for a lunar rover to perform tasks on the surface of the moon. Participants should have a basic knowledge of scale factor and application of the Pythagorean theorem. Having access to a calculator is helpful but not necessary for session.For more information and to register online, visit https://digitalmedia.wufoo.com/forms/nes-webinar-registration-pythagorean-theorem/. This 90-minute Web seminar will be held on April 3, 2012, at 8:15 p.m. EDT. Learn how to use authentic NASA mission data to investigate the composition and distribution of ices in the high latitude regions of Mars through analysis of visible light, infrared light and gamma rays. The seminar includes information about a unique student extension activity, where students access a free computer simulation illustrating how gamma rays are used to determine the chemical composition of Mars.For more information and to register online, visit http://learningcenter.nsta.org/products/symposia_seminars/NES2/webseminar1.aspx. This 90-minute Web seminar for educators will be on April 5, 2012, at 6:30 p.m. EDT. Review criteria for determining if something is alive and learn how students can apply the criteria in a hands-on activity. A video will be shown that connects the activity to a NASA mission. Collaborate with other participants about ways of using and adapting the activity. Extension activities for students interested in the topic will be provided.For more information and to register online, visit http://learningcenter.nsta.org/products/symposia_seminars/NES2/webseminar7.aspx. Teachers Speak Out! – Middle and high school science, technology, engineering and mathematics teachers nationwide comment on NASA Explorer Schools’ Virtual Campus, and on the value it adds to their teaching techniques, as well as to their students’ interest and performance. Make NASA a part of your National Science Teachers Association, or NSTA, experience this year! The 2012 NSTA’s national conference is being held March 29 – April 1, 2012, in Indianapolis, Ind. Dozens of NASA presentations, workshops and short courses are scheduled during the conference. To find NASA sessions that fit into your schedule, visit http://bit.ly/nsta2012. Also, stop by the NASA exhibit booth (#2159) to learn about exciting new NASA programs and products. NASA Explorer Schools, or NES, representatives will be there to share information and answer your questions. If you are not yet a participant in the NES project, you can obtain detailed information about NES by visiting the NASA exhibit booth or attending a NES presentation. The session, “Teach STEM? NASA Explorer Schools Can Help!”, takes place on Fri., March 30, from 11 a.m. – noon in the Cabinet Room of the Westin Indianapolis. 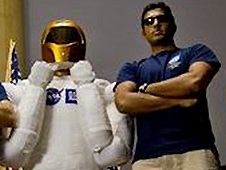 •	Virtual Lab and NASA Explorer Schools on Friday, March 30 from 4 – 4 45 p.m. in room 142 of the Convention Center. •	The “NASA Engineering Design Challenge: Spacecraft Structures” session takes place on Sat., March 31, from 9:30 – 10:30 a.m., in room 111/112 of the Convention Center. Attend these presentations and see how NES helps teachers by packaging everything needed to deliver an exciting NASA-related lesson to students! 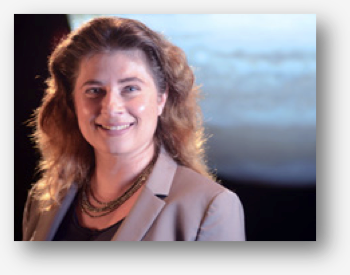 As part of a series of electronic professional development experiences for educators, the NASA Explorer Schools and Learning Environments and Research Network, or LE&RN, projects are hosting a 60-minute live professional development Web seminar for educators on March 29, 2012, at 8 p.m. EDT. Misconceptions about black holes will be addressed, as participants learn background information about the structure and behavior of one of the universe’s most mysterious and spectacular bodies. Learn how to derive the equations used in the Black Hole Math problem set for students to better understand the physics of black holes. 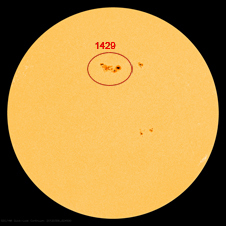 This is the sunspot region AR 1429 that has generated several major solar storms recently. The video covers nine days (Mar. 4 – 12, 2011). Notice how the spot continually changes as its magnetic fields realign themselves. The images are white light images called intensitygrams captured by NASA’s Solar Dynamics Observatory (SDO). How do NASA scientists use geometry and measurement to predict the behavior of dangerous solar storms? Use the problems in the NES featured lesson, Geometry: Space Math Problems — Solar Storms, to bring relevance to your classroom by connecting your lesson to recent solar activity. In these problems, students analyze images of a solar tsunami and use geometry and measurement skills to find the speed of the wave. They step into the shoes of a NASA scientist and use geometry to find the speed of a coronal mass ejection, or CME, also known as a solar storm. CMEs can have hazardous effects on the International Space Station and astronauts. To see how you can use Space Math Problems with your students, take a look at the NES video collection for teachers. instrument on ESA’s Proba-2 satellite. Every day our Earth experiences storms of all kinds including one type of storm that we often don’t realize we are experiencing — a solar storm. Thanks to our protective atmosphere and magnetic field called the magnetosphere, we’re safe from the dangers of solar storms. On March 10, 2012, the sun released another two M-class flares. One, rated as an M5.4, peaked at 12:27 a.m. EST. The second, rated as an M 8.4, peaked at 12:44 p.m. EST.These two flares came from the same active region on the sun, designated number 1429, that has already produced three X-class and numerous M-class flares over the past week. On March 8, 2012 at 10:53 p.m. EST the sun erupted with an M6.3 class flare, and about an hour later released a coronal mass ejection or CME. These eruptions came from active region 1429 that has so far produced two X class flares, and numerous M-class flares. NASA’s Space Weather Center models measure the CME traveling at speeds of over 700 miles per second. 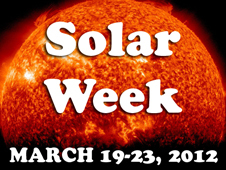 For more information about Solar Storms, take a look at NASA Now: Solar Storms.